If you're anything like me, seeing that title you might be rolling your eyes or groaning but... watch the trailer. Seriously, I don't watch the cartoon, but I want to see this! And if you love the cartoon, you're going to want to watch it even more. I'm usually not a Pokeman fan either, but that trailer is cute. BTW, since this is live action, I think it is better suited in the Fantasy Movie Board. What do you think, LouiseX? No worries, LouiseX. I figured since the other live action movies for animated films are in the Fantasy section that this would be better suited there too. I'll move it shortly. This film looks pretty awesome and (With any luck) should appeal to the Pokemon fans out there. This will be interesting to see if the balance is correct. I really want to see that film! I definitely wouldn't call myself a pokemon fan, I don't watch the cartoons or previous films and I never played the games until Pokemon Go. 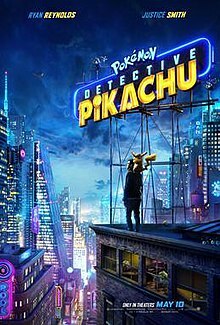 But this film really appeals to me and I know enough about the pokemon from Go that I think I'll be able to follow it... and my Mum can explain the rest since she is an avid watcher. Since we already had a thread for this, I went ahead and merged your thread with the existing one, magicmuggle01. Wikipedia lists this as a fantasy, action, comedy and mystery film, so I'm not sure where it belongs, but I left it in Action/Adventure for now. Feel free to let me know if you think it belongs in one of the other sub-boards.